Shaban Muhammad (right) battles for the ball with Zambian defender Ngosa Sunzu yesterday in a game he scored a brace to cap his debut. Courtesy photo. Just hours after scoring a brace against Zambia in the COSAFA U20 tournament opener, Hippos captain Muhammad Shaban expressed his joy to fans and team mates. “I find pride in putting on my national colours,” read a statement on Shaban’s official Facebook page. “I thank Allah for having scored a brace and man of the match performance. I dedicate this all to my team mates because it was not only about me but our(team)spirited fight that earned us the victory,” he added. “To the fans back home, reading through your Facebook updates closely following this journey leaves me helpless but to say thank you all for the support,” he continued. The KCCA FC teenage sensation, who was making his debut for the U20 side, proved as to why many regard him as the future of Ugandan football when he flicked a Steven Mukwala cross in to the back of the net on 52 minutes. 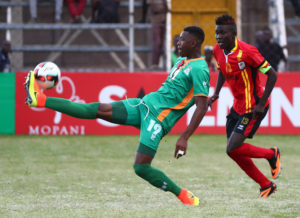 Four minutes later, Shaban made it 2-0 to the Hippos when he lashed onto goalkeeper Saidi Keni’s long ball and lobed the on rushing Zambian goalkeeper . Throught the game, the former Onduparaka captain who is also skippering the U20 side led his peers but example and commanding them on several occasions. Only over a month ago, Shaban was not playing active football after his former side Onduparaka had stalled his move to KCCA FC but as soon as he was cleared, he resumed to doing what he does best as he scored four goals in his first two games for the Kasasiro Boys including a debut strike in the 2-0 home win over then table topping side Police FC. By the time he was summoned for the U20 duty, he had scored six goals in four games hence joint second top scorer in the league. Yes he has his own issues on and off the pitch but as per now, no Ugandan will care as he continues to impress whenever he is given a chance. Come December 16, Shaban may have the COSAFA tournament trophy in his arms which may most probably also delight Onduparaka who just a few weeks ago tried to stop him from continuing his career. Uganda now leads group A with three points from one game followed by Malawi who defeated Swaziland 3-2 in the earlier kickoff. Uganda’s next game is against Swaziland on Friday before playing Malawi on Monday in the final group game. Results from the other matches played yesterday.